After a journey for 54 days, It has reached a stage where Chennai will meet Mumbai a dejavu of 2010 finals. Will Chennai make history repeat itself or Mumbai will help themselves to win their first ever IPL trophy. Big Finals – Rohit Sharma won the important toss and decided to bat in a slow and tricky pitch. Not a ideal start would have wanted as Mumbai were three down with 16 on the board, with skipper being the last victim. Karthik along with Rayudu struck for a moment and made damage control to put Mumbai Indians back on track., Once karthik was dismissed in came Man from Caribbean, Kieron pollard, who owned this format of cricket, played a gem of an innings even though people around him kept walking away from him. He ended the match with two monumental back to back sixes to give Mumbai a good score of 148/9 in a tricky pitch. Chennai needing less than 150 to win, got off to a dreadful start, losing 3 wickets that of Hussey, Raina & Badrinath with just 3 on the board. It was Karthik & Rayudu who did the damage control form Mumbai from same position, but Vijay & Bravo failed to do and Jadeja followed with a worst shot of his lifetime to get out for a duck. Which made CSK 39/6 in the half way. Chennai was left alone with their skipper to do the job, but even for him it was too big pill to swallow. However he tried as much as he could, which is clearly visible by the fact, Dhoni has scored 63 runs and all the other 10 players put together scored just 62 runs. In the end Mumbai Indians won their first ever IPL trophy and became the champs of IPL 2013/Season 6. However even before Mumbai could soak in the happiness of lifting the cup, Sachin announced himself saying that he is retiring from the IPL cricket. Expected him to play for one more season, but still Legend has made his call when his team has delivered a the icing in cake for him. Young Player of the Tournament – Sanju Samson of Rajasthan Royals. Most valuable Player – Shane Watson of Rajasthan Royals. – This is just the 13th match out of 37 played in Eden gardens won by team batting first. – Mitchell Johnson now has 16 wickets in powerplay overs highest by any bowler for this season; he was closely followed by Mohit Sharma with 15. – Rohit Sharma has just scored 12 runs in all the three playoff matches. – 3/34 is the worst powerplay score for Mumbai for this season. – This is fourth time a team has lost 6 wickets before scoring 50 runs, CSK have been there twice and both against Mumbai. – History continues to repeat as table toppers in league stage have never won the tournament, this time CSK loses it after topping the table. – 4/42 by Bravo is the second most expensive spell in IPL after picking 4 wickets. – 148 runs target set Mumbai Indians is the lowest for an IPL final which is held in India. Deccan’s set 143 in 2009 but it was in SA. – This is also the first time Mumbai have defeated Chennai in a knockout situation games. – Dwayne Bravo became the first bowler to pick 32 wickets in an IPL season, previous best was 28 by Malinga. IPL 6 – M Hussey. – It is also an ironical fact that Chennai have lost all their matches played on a Sunday in this season, and continued the trend even in finals. 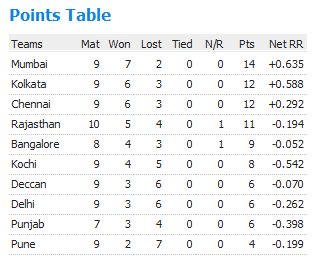 Last week in IPL 6 and it starts with Top two teams in the table meet to decide who is gonna get the double promotion and be there on a Big Sunday.. Is it going to be fifth time for Chennai or second time for Mumbai…? Qualifier 1, Dhoni won the coin and decided to bat first, When the big day comes, Chennai is totally a revamped team, CSK got off to a good start with 52 runs before losing Vijay while trying to up the run rate. Then came the partnership between Mr.Cricket Hussey & all time CSK star Raina, which changed the total complexion of the game. Hussey was subtle in his touch & class in anchoring along with Raina who showed the pure aggression & T20 style of batting. Both put on a 140 runs partnership in 76 balls which helped CSK to post a taunting 192/1 in 20 overs. Mumbai without Sachin lost Aditya tare very early, but however Dwayne Smith scored a blistering blitzkrieg fifty of 21 balls to get Mumbai off to a flyer. But its that man again with golden arm for Dhoni, Sir Jadeja who picked the dangerous Smith at 68 of 28 balls. Once he is out suddenly Mumbai looked like headless chickens. Karthik got out sweeping to a straight ball, followed Skipper Rohit Sharma. For a very Brief moment Pollard looked like turning on the game with two back to back sixes off Jadeja, But u always know you can’t get away from Sir, just after hitting two sixes, so he had the last laugh by dismissing him and picking the third wicket of the day in the very same over. From then it was just Catching session for CSK, as Mumbai batsmen came to scoop the balls in the air and CSK fielders made sure they picked every one of them without missing. In the end Mumbai were bowled out for 144 in 18.4 overs. – Bravo picked up his 14th Catch of the tournament; he leads the list of highest catches taken for this season. – Dwayne Smith scored his fifty in 21 balls, which is the fastest for him in his IPL career, bettering his previous best in 34 balls. – Mumbai now have lost four games when they have been asked to chase more than 190+. – 192/1 is the CSK highest score with just losing a single wicket. – 4-0-45-0 spell by Malinga is the most expensive one in IPL. – 140 runs partnership between Hussey & Raina was the third time both involved more than 100 runs partnership. List is topped by Gayle & Kohli pair with 5 century partnership. – 51 runs scored by CSK in last five overs against Mumbai is the highest by any team for this season. – 47 runs scored by CSK in powerplay overs is the highest for CSK against Mumbai , also this first time against Mumbai they have never lost a wicket till the powerplay overs were finished. – Michael Hussey scored his 6th IPL fifty for this season and first against Mumbai Indians in his IPL career. – 28 wickets taken by Bravo equals the most wickets taken in an IPL season along with Lasith Malinga in 2011. – Chennai has qualified into all the finals when IPL was held in Indian Soil. In season two they were knocked out in playoffs were it was played in South Africa. – Chennai now have both Orange Cap (Mike Hussey) & Purple Cap (Dwayne Bravo). Last time when these two teams met, to a big surprise Pune defeated CSK, courtesy Steven Smith’s handy knock. Can the history repeat itself. Not really with a kind of form Men in yellow as of now. Chennai won the toss and decided to Bat first, Lost the openers in quick succession, in form Hussey departed very early, finally giving a chance for Badrinath to bat, He stitched a partnership with Suresh Raina and gave CSK a solid platform for the skipper Dhoni to unleash himself in the last 5 overs and he just killed PWI by scoring 45 of 16 balls to end the CSK innings with 164/3 in 20 overs. PWI never looked like they are going to chase this score stated losing wickets in heaps, they lost top 4 in no time and 6 down in 9 overs summed up the whole game. Mohit Sharma bowled well to pick 3 crucial top order wickets. As always Steven Smith was the only man who tried to put a fight, but too much for him to handle. – Mohit Sharma now has 9 wickets in the powerplay overs, most by any bowler for this season, followed by Johnson & Bhuvaneshwar Kumar at 7. – Ravindra Jadeja bowled the first no ball in his IPL career, previous to that ball he has bowled 774 balls in IPL. – It is also the first time Jadeja has opened the bowling for any team in IPL. – Steven Smith crossed 500 IPL runs today, becomes the third one to cross without scoring a fifty in the total runs scored. Other two were Jadeja & Nayar. – Suresh Raina scored his 16th IPL fifty, which is also his second slowest which came off 42 balls. – Raina & Badrinath now has 8 fifty partnership between them. – Hussey dismissal in 5 runs is the lowest score he has been dismissed for this season. – MS Dhoni scored the 350th six for this season. – Bhuvaneshwar Kumar bowled the 24th Maiden of this season. 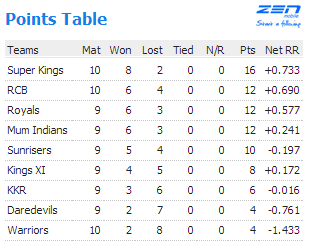 – CSK have won 6 games on a trot now on this season of IPL. – A victory by 37 runs for CSK against PWI is the highest for them, previous best was 25 runs in 2012. First Game, Game of heavyweight’s Chennai taking on Kolkata, Gambhir won the coin and strangely decided to field first, Which helped Dhoni & Men to salve themselves from the scorching sun and make KKR pay for their mistake. Mr Cricket does it again & again for CSK. Today with another breath taking 95 runs in sapping conditions, well supported first by Saha (who got the chance because Vijay is injured) then later by Raina. As always Dhoni finished up the innings in style to post their highest score for the season. CSK ended up with mammoth 200/3 in 20 overs. Chasing almost 10 runs an over, KKR got a delicious first over from rusty Nannes who gave 14 runs away as freebies, not only that today, CSK totally looked awkward in fielding & bowling except for one or two overs. Thanks they had enough runs on the board to save themselves from the mistakes. Bisla’s monumental effort almost gave KKR the victory before Huss Monster shacked the stumps to break the hopes of KKR. A good last over from Morris ensured CSK won the match finally. They chase or defend, it doesn’t count, one thing for sure is Last over & tense moments, where CSK will emerge victorious. Second game battle for wooden spooner’s as the last two team in the table fight out their last position to rise over the above. Everyone of the Delhi batsmen had a start but as it was the case in the tournament, failed to convert it, And again Warner played a important knock of 51 from 25 balls to put Delhi at a comfortable zone of 164/5 in 20 overs. Pune started off well, thanks to poor fielding efforts from Delhi, Finch & Uthappa made 37 runs each before getting dismissed in the same over, which opened the back door Delhi and they started sneaking past slowly & steadily, Luke Wright also helped their course with poor batting. Finally Delhi just moved up the ladder a touch up to end up at 8th position in the Standing list. – Wridhimaan Saha scored the 300th Six of this season. – Suresh Raina picked up his 100th Six in his IPL Career; he is also the second in all time highest in IPL. List is topped by Gayle with 164 sixes. – CSK now has 4 scores by their batsmen from 90 to 99. In those Hussey has two of them. – This is second time by Kallis conceding 50 runs in an innings. – 1/35 by Sunil Narine is the costliest spell for this season. – CSK now has 5 century opening stands, latest one is between Saha & Hussey worth 103 runs. Only Rajasthan royals have 6 opening century stands. – Hussey scored his 10th IPL fifty. – 67 runs scored in Powerplay overs by CSK is the highest for this season, and their all time best is 68 runs. – 200+ runs have been chased 4 times in IPL history so far. – 12 extras in the Nannes first over is the most conceded in an over, previous was also 12 runs conceded by same team CSK. – 0/50 runs conceded by Dirk Nannes is the most expensive spell in his IPL career. – 92 runs scored by Bisla is the best for him in his IPL career, bettering 89 he scored against the same team in the same venue last year in IPL finals. – 351 runs scored between Yuvraj & Uthappa is the most by any pair so far in this season of IPL. – Robin Uthappa played out the 4th Maiden of this season, which equals with Chris Gayle who also played 4 maidens so far. – Irfan Pathan bowled the 21st Maiden of this season and personally 10th in his IPL career. Only Praveen Kumar is ahead of him with 12 Maidens. – 63 runs scored by Delhi in the last five overs is the highest for them for this season. – Fifty scored by David Warner in 24 balls is the fastest for him in his IPL career. – Bhuvaneshwar Kumar has now taken 7 wickets within the powerplay overs, highest by any bowler for this season. – Michael Hussey scored the 4th fifty of this season highest by any player, followed by Gambhir with 3 fifties. – Michael Hussey also became the first player to score 50 boundaries for this season; he now has 51 to his name, followed by Gambhir with 40. – CSK conceded 20 extras in today’s match against KKR, highest ever by any team for this season, the next worst by RCB who gave 16 runs against the game of Rajasthan royals. 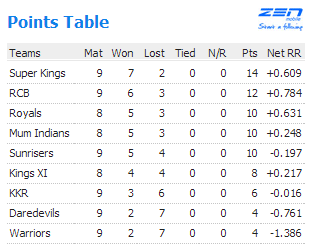 Delhi needing to win to stay in hunt desperately met CSK in their den. Apart from getting CSK to Delhi, nothing went as planned for Delhi, Dhoni won the toss and decided to Bat first. Vijay & Hussey gave a start, Raina capitalised on it, Dhoni trounced Delhi to set a target of 170 runs in 20 overs. People seeing the squad in papers will feel this is definitely achievable because you have Shewag, Warner, Mahela to follow, But its all in Papers as in reality except for a new comer Kedar Jhadev no one even cared to stay in crease for a brief moment. On the other credit goes to Dhoni & Co as they kept bowling very tight, and fielding was outstanding. Which meant only one thing Delhi succumbed to their lowest ever score in IPL History. – Suresh Raina played the 100th game for CSK, including 84 games in IPL & 16 games in Champions League, In fact it is also the 100th game for CSK, which meant, Raina hasn’t missed even a single game for CSK. – Hussey & Murali Vijay became the first opening pair to put up 1000 runs partnership between them. – 50 runs scored by CSK in 7.2 overs, is the fastest for them in this season. – Suresh Raina scored the 200th Boundary of his IPL career. – In their 100th Match, CSK picked up their 50th Win, highest ever by any IPL team. – 3/10 by Mohit Sharma is his best IPL bowling figures. – Delhi all out for 83 runs is their lowest score, bettering the previous lowest of 87 runs against MI. – 86 runs victory is the second largest victory for this season, just a run behind the victory of Royals against Mumbai Indians. – Dwayne Bravo now has 33 IPL catches to his name and he is just behind Rohit Sharma & Suresh Raina in the most catches taken list. – Today’s loss is the straight eighth one, losing qualifier & eliminator last year and 6 on a trot this year. Champions are back when they thumped KXIP with a 10 wicket victory. KXIP started well with David Hussey and Gurkreet Singh, as they were 106/4 in 14 overs. Some tight bowling from CSK and poor shot selection from KXIP batsmen ensured that they are all out for 138 with a ball left. Chennai started off slowly and went berserk as the time passed on, KXIP had to ruin themselves as they missed 2 to 3 chances which was there for taking. – Partnership of 139 runs between Hussey & Vijay is the highest for any wicket in this tournament bettering 132 runs by Dinesh Karthik & Rohit Sharma. – Partnership of 139 runs is also the highest for any wicket against KXIP in any season, and also best in Mohali ground again for any wicket. – Both Hussey Brother’s David & Michael went past 1000 runs in IPL career. – Victory by 10 wickets is the first for this season. – Chris Morris made his IPL debut, and his debut wicket came as Azhar Mahmood tried to slog and ended in the hands of Ashwin. Match 43, Chennai takes on Rajasthan in their home ground, where just like their opponent’s Rajasthan Chennai have a fantastic record this season, having played 4 and won all those in style. Royals got off to a classic T20 Start, thanks to Dravid, who even looked better than hard hitting Shane Watson, At the middle they were well set with 86/0 in 10 overs, looked to go beyond 180 in ease, but some brilliant bowling, fielding and excellent catches turned the match upside down for CSK, Allowing RR to finish at 147/6 in 20 overs. The chase looked so easy even after losing Vijay so early, Raina and Hussey made the things so simpler and played with the clear plan to chase down 148. Eventually CSK won their 5th Home game i style with 8 wickets and 8 balls to spare. Match 44, Game of life and death for Pune but it wasn’t seen in their performance, as they had their best bowler Alfonso Thomas going for 53 in his 4 overs. Tendulkar, Rayudu, Suman and Pollard all had their go to get Mumbai to 160/7 in 20 overs. Only stand out performance for Pune was Rahul Sharma who finished with the magical figures of 4-0-7-2, with awesome economical rate less than 2. But its always said one man can’t win 11 person’s game. In the chase Uthappa and Pandey tried their best to get close the score and none looked to go for the kill, Attitude made the task so easier for MI bowlers and they won the game easily as PWI went past 139/7 in 20 overs, leaving 21 runs short of the desired target. – Rahul Dravid scored the first Fifty in the Rajasthan Royals Jersey and 6th overall. – 86/0 in first 10 overs is the highest ever score for Royals for this season. – Manish Pandey scored his first fifty for Pune Warriors. – Suresh Raina scored his 14th and Michael Hussey scored his 5th IPL fifties. – 137 runs between Hussey and Raina for 2nd wicket is tied with two more occasions for the 2nd best wicket partnership, ironically on all the three 137’s Raina was out there and Vijay was their twice and now Hussey. – 137 runs partnership between Raina and Hussey is the third best Partnership of IPL 4. – 86 runs partnership between Rahul Dravid and Shane Watson for the first wicket is the highest for Royals in this season of IPL; it’s also the highest for any wicket. – Mithun Manhas (PWI) became the second batsmen to secure 3rd duck in his 9th innings, other one was Gomez (KTK). – Rahul Sharma’s figure of 4-0-7-2 is the best economical spell bowled in the IPL 4 so far. – Rajasthan Royals had no sixes been hit in their match against CSK. – Harbhajan Singh bowled the 17th Maiden of IPL season 4.